2019 is here, and with it comes a new year to tackle oral health success! Here’s our keys to a healthier mouth this year. Fibrous fruits and vegetables actually scrub teeth as they are being consumed, which helps remove bad mouth bacteria that lead to cavities and tooth decay. When eating fibrous fruits and vegetables, be sure to wash them thoroughly and leave the skin on – which is a huge source of fiber. Good sources of fiber are: apples, kiwi, berries, bananas, carrots and celery. The general rule of thumb for mouth healthy food is the more fiber and water content, the better! Saliva naturally cleans the mouth, and a dry mouth will likely lead to halitosis – which is basically ongoing bad breath. Nobody wants to have bad breath, but halitosis can be combatted by adding more water to a diet, which will keep saliva flowing and naturally clean teeth of food debris and excess sugar. Brushing twice per day is a great way to clean most of the surface area of teeth, but it doesn’t clean all of it. The AAPD recommends that everyone floss once per day, and to floss between every tooth. Flossing clears food debris from the cracks between teeth. Food debris can fuel bad bacteria that cause plaque buildup and cavities. Try to floss with your child at first, so that you can show them the ropes. 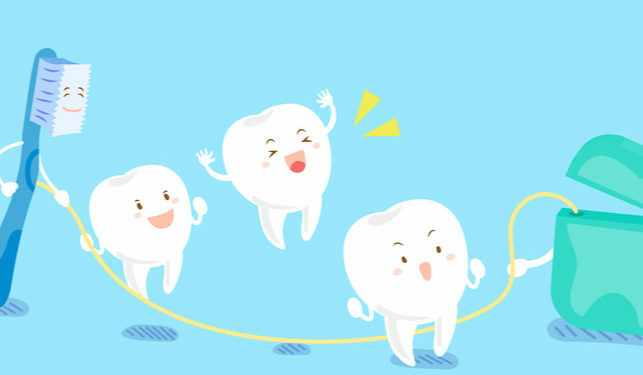 Once you’re confident that they can do it on their own, implore them to floss nightly before bed. The American Academy of Pediatric Dentistry (AAPD) suggests that children visit the pediatric dentist every six months to ensure that they are keeping their mouth as clean as possible. This regular checkup allows dentists to check on any potential oral health issues, and gives parents a chance to learn more about the overall health of their child, and how they can improve their oral health. Missing a checkup appointment can allow untreated oral health problems like cavities and tooth decay to worsen into more serious ailments that are more difficult and costly to fix.